A ready to go business delivered to your door, the Hydro-Suite is a custom built static portable hydrotherapy unit which is designed to house our Underwater Treadmills and Hydro jet pools or even both together. 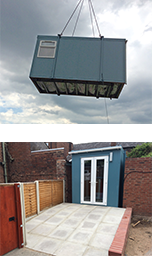 We will produce a bespoke unit to meet your exact requirements, incorporating size, colour, doors, windows, toilets, floors and lighting into a state-of-the-art design. We will custom build to your requirements, ie; size, colour, doors, windows, toilets, floors and lighting.